Many cyclists don’t know what insurance they need (or may already have) to cover theft, injury, and liability. As cyclists, we do our best to keep ourselves safe on the roads, and keep our valued machines from being damaged or stolen. But have you ever thought about what would happen if your bike were stolen, or if you were to get in a collision or even cause one? Insurance to cover these three events (theft/loss, collision/injury, and liability) can support you. Standard homeowner’s or tenant’s insurance policies typically cover bike theft/loss up to $1000-$5000*, and this protection extends to when you’re travelling. However, standard policies may not cover the full value of your bike (depending on what it’s worth) and may have a high deductible (up to $1000) for claims. 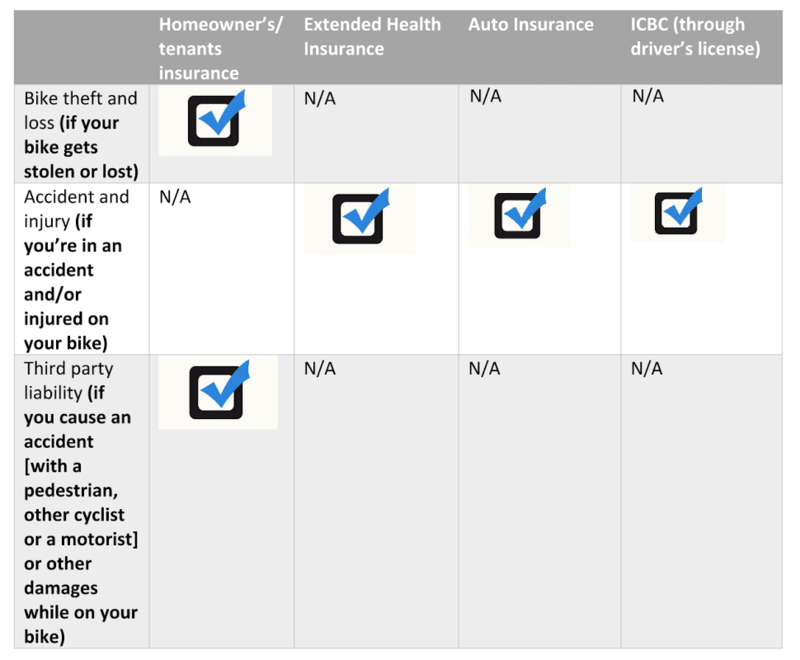 For around $5 per $100 of value of your bike per year, you can add special coverage for your bike (an endorsement) to your homeowner’s or tenant’s insurance. This can cover the full value of your bike, and have a zero or low deductible in the case you need to make a claim. For bike injury-related healthcare costs that extend beyond what’s covered by your Medical Services Plan, a couple of insurance policies may apply in supporting your return to health. If you’re hurt in a collision where a driver is at fault, the driver’s auto insurance will cover medical costs including dental care and physiotherapy, as well as general damages for pain and suffering, and wage loss. Of note, holding a valid BC driver’s license can support you with $1M in the case that at-fault drivers are underinsured, and this protection can be bumped up to $2M for an additional $25/year. Extended benefits packages (e.g. Pacific Blue Cross), or mortgage insurance generally provide “accidental death and disability” coverage which provide pay-outs for different amounts depending on your injury. In the case you are deemed at fault for a collision, you may need third-party liability insurance to cover damages. Standard homeowner’s/ tenant’s insurance contracts cover around $2M in third-party liability. Not all contracts cover you though - it’s important to check the wording in your policy to determine what specific liability coverage you have. Stay safe on the roads and enjoy your ride! See our safety courses and resources for more info on how to keep cycling enjoyable and safe. If you are interested in cycling insurance or have questions related to broader insurance, HUB Cycling has partnered with Shaw Sabey whose dedicated team of specialists is eager to help HUB Cycling’s members and affiliates with tailor-made home insurance advice and solutions that include cycling-specific coverage. Shaw Sabey has a team of dedicated professionals who recognize the importance of insurance that is tailored to you and your lifestyle. As your bike is an important part that lifestyle, it is important to have coverage to safeguard this treasured possession. Shaw Sabey has expertise and connections to provide you with broad coverage for your bike and home, at competitive pricing. Please complete the short application form and return it to cycling@shawsabey.com and you will be contacted shortly to discuss your options and develop a coverage plan that fits your lifestyle. The HUB Cycling team thanks our committed volunteer Paul McArthur for all his work researching and developing this information package for Metro Vancouver cyclists. * We’ve added estimates in the article for guidance, but depending on the provider, insurance policies can range significantly in what they cover. We recommend reviewing the language of your policy with your provider to figure out what, how much, and under what conditions your insurance extends to cover you and your bike. A printable version of chart and information can be found here.